The Webster University Department of Music kicks off the 2018-19 performance season with an Instrumental Faculty Showcase. This first event of its kind will take place Sunday, Sept. 9 at 4 p.m. in the Winifred Moore Auditorium. 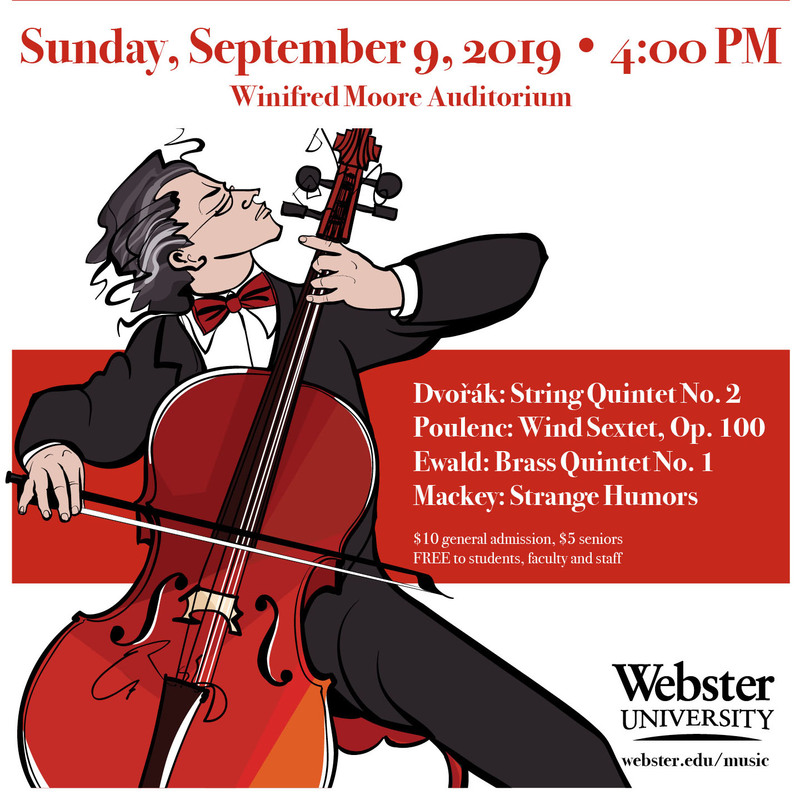 The performance features the entire Webster University Instrumental Faculty performing hallmark works from the string, woodwind and brass repertoire. The unique program begins with the Faculty String Quintet performing the opening movement of Dvorak’s String Quintet in G Major, op. 77 with new faculty member Matt Pickart, along with Nicolae Bica, Anna Lackschewitz, Ken Kulosa, and Erik Harris. The second work features the Faculty Woodwind Sextet performing Frances Poulenc’s Sextuor op. 100, with Paula Kasica, Cathy Woelbling-Paul, Jeanine Garesche, Eric Ring, Tricia Jöstlein, and Nancy Mayo. Following is the Faculty Brass Quintet, performing Viktor Ewald’s Quintet No. 1 with Michael Walk, Robert Souza, Tricia Jöstlein, James Martin, and Troy Marble. The final piece features the String Quartet again with Erin Elster, percussionist, performing the modern work by John Mackey, Strange Humors. Join the Department of Music for this thrilling way to start the new season! FREE to all students, faculty, and staff.